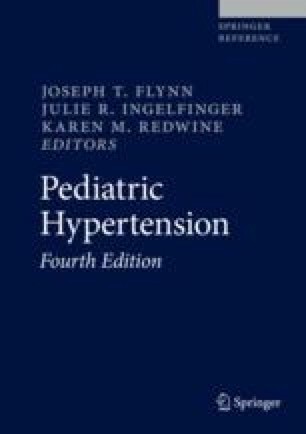 Hypertension and left ventricular hypertrophy are highly prevalent in the pediatric dialysis population. Ambulatory or home blood pressure monitoring is required to obtain prognostically relevant information about a patient’s blood pressure status. Volume status is the primary determinant of blood pressure in dialysis patients; the clinical relevance of additional pathogenic mechanisms such as sympathetic hyperactivity is controversial. The most important measure to maintain normal blood pressure is achievement of the dry weight, which can be facilitated by the use of bioimpedance analysis and intradialytic blood volume monitoring. Dietary salt restriction and avoidance of net salt uptake during dialysis is key to maintain fluid balance. Extended hemodialysis schedules efficiently normalize blood pressure and reverse left ventricular hypertrophy in patients who cannot maintain fluid balance under standard thrice weekly hemodialysis. Pharmacotherapy of hypertension should only be reserved to patients with persistent hypertension despite adequate volume status. The preferable first-line antihypertensive drug class is currently unclear; head-to-head comparative trials are urgently needed. Arbor Research Collaborative for Health. The DOPPS Practice Monitor. www.dopps.org/DPM/. Accessed 30 Jan 2017.